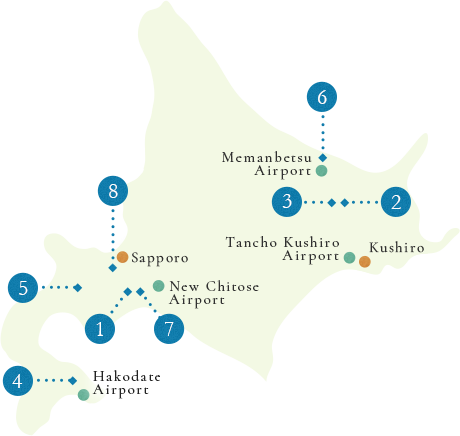 Tsuruga Group have 12 individuality hotels in Hokkaido. Particularly, we introduce the 8 Japanese Ryokan of an onsen have the enjoyable room with private open-air bath. There are each unique facilities, that makes you happy. Spend precious and luxury time which you like. Feel nature in Hokkaido and enjoy soaking a hot spring. We introduce Careful Selection of the 8 hotels that it has private open-air bath in the room. How about spending some time luxury and a mild with soaking a hot spring for your mood ? It will be the top one of the executive class in Tsuruga group. "碧 Ao" is represented shiny jewels like gemstone. Imagine opening the door to your private room as you escape into a world of your own.Relax on the sofa as you contemplate the days activities for that perfect getaway. "HINA" means Home. It is always in your heart somewhere, feelings to the homesickness which isn't forgot. Also, warm dearly and your heart may be emancipated with aware like a home. We are welcoming you at "HINA NO ZA" as a home on your heart. ※Please note that we do not accept under 12 years old according hotel policy. The viewing of Lake Akan can also be enjoyed while Soaking in Onsen that away from busy daily. The living room has extensive space and design with Japanese style, you can enjoy a relax time with your family in this luxury type room. Production your best time which satisfy the desire of return to natural rather than noisy city life. Relax in the quiet sounds of wind blowing through the trees, hearing the birds singing. The room is in harmony with Japanese style tradition and sensitivity of the ground. Have a good sleep to forget fatigue of travel with the settled space wrapped silently. Between Japanese style room and Relaxation room without partition, enhances overall sense of spaciousness such as an house. The Onsen open-air bath offers private views of the exceptional scenery for you that watch the sunset or sunrise while soaking in the hot spring. Feel the wind blowing on the terrace, enjoy the Onsen time. The rooms have set a terrace outside with private views of the Mini Japanses Style Garden. The room size is just fit to share time with your partner, slip into your own little world. Have been hearing the sound of the wind, soaking yourself in the abundance hot spring. Have Japanese Style design and a heart-warming function which the bath tubs constructed from stone. Can fully relax time in it. The Onsen bath tub has a classic Japanese design feeling warmer. The hotel becomes the starting point of our tsuruga group. There are 23 kinds of different room type, and each meals. The hospitality of meals, onsen, and our smiles. We offer to enjoy infinity to be fit your travel intention. See Lake Akan and Mt Oakandake spreads from large window. In the living room decorated the interior base on Ainu design style, and Impressive red color wall co-produced more high-grade room area. When you soak in an onsen open-air bath, have be feeling the wind blew through your skin seeing four seasons change scenery. During enjoy panorama view of Lake Akan and relax time in room. Guests can see spectacular lake view feeling a illusion such as float on the lake. Can enjoy soaking in the onsen and during feel seasons changes of Lake Akan from the room open-air bath. Steam rises over the glass settlement, and pour into hot-spring source in the ceramic bath. Invited to hot water sound, take a bath before resting, and during seeing nature outside in the morning. Please enjoy taking an onsen many times for your private feeling your mind. With the lush nature views of Lake Akan, having an onsen luxury holiday. The room is constructed "Japanese style modern", have both stability of Japanese style and functional Western style. Guests can feel great nature view of Lake Akan from a guest room's open-air bath which bathing legitimated hot spring water. Also, enjoy the Lake Akan each season view from large window of the living room. Beautiful and magnificent nature. The herb and flower garden seems to be Hokkaido. The auberge can be enjoyed abundance of the place in South Hokkaido Onuma that is particular about the location with satisfied for all of the five senses. Enjoy a luxury holiday with relaxing, being in comfortable space. The luxury room with detached a spa living space. Satisfied with being wrapped in abundant nature, please enjoy a special time. A spacious twin room have open-air bath onsen on the deck. You can relax looking around nature leisurely while taking an onsen from the deck preparing open-air bath. Moku no Sho is located on the bottom of Mt. Yotei, we think a great deal of the warmth of woods, and Japanese sense of beauty. The moment of a relief of a customer serenity is piled on the longer time such as in the feternal time of the forest large trees. The Japanese style onsen Ryokan retuned to the other home. Japanese style living glad on the tatami floor can be laid, and the next is prepared open-air bath at the deck terrace then with sauna. 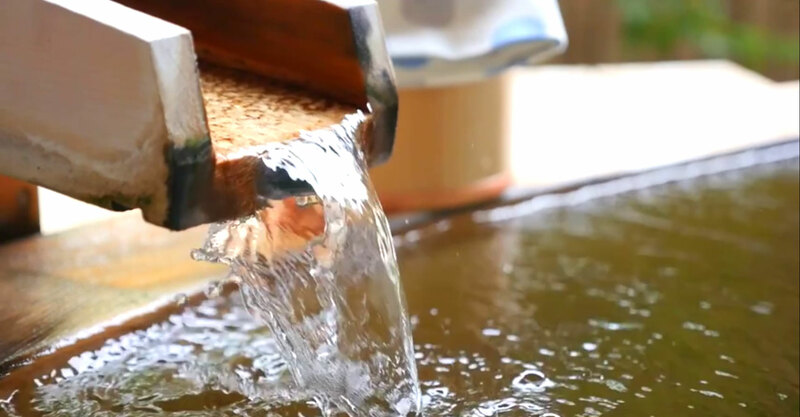 Please enjoy soaking an onsen individually hearing little stream, and the next wrapped in nature abundant in niseko. A combination of Japanese style living room and twin bed room, offering ample space to relax and unwind in this type rooms. Indulge yourself in the natural surroundings of Niseko from the comfort of room with private open-air bath. After healing a bath "Meisen no Yu", also enjoy before sleep, and wake up in the morning immediately. It is prepared Japanese style room to have a peace of mind, and the Western and Japanese mix style room with Twin room of comfortableness. Resort space of the new style which drives expectation in a romance of the old race that lives Sea of Okhotsk coast stretch including Abashiri and has disappreared short formerly. Range in the earth and Lake Abashiri are viewed under the slightly elevated hilltop and eyes. We will guide you to eternal time and space from a place by the Sea of Okhotsk. Ko no Za premium room "Ama"
Suite with open-air bath "Ko no Za"
Look at an abundant green garden and relaxes. The most largest type of room is "Ama" at the Ko no Za floor. Separated 2 room Western and Japanese style, is prepared the space of relax variously. Also, arranged comfortably especially an open-air bath and balcony. The open-air bath with room's private garden are provided for all the rooms at Ko no Za Floor. Describing the romance story of Sea of Okhotsk, as well as welcome you to join in. How are you going to spend your free time in here? A warm water bath, aesthetics, fitness, walking, meals, sleep and information aim at the water which is a source of the life, and are healthy from all faces, beauty is total produced. We offer you a resort scene of a new style with the theme of the cure and the health. Looked around Lake Shikotsu from bigger window of your room. Also prepared the kichen where you can cook lunch for guest of a stay for several days easily. Japanese and Western room has comfortable space. soaking in onsen as much as you want while enjoy the forest view in Lake Shikotsu. Bed room, living room and open-air bath area have connected one comfortable room space. Prepared large window and relaxation tatami mat in living room provides more broad space. Be fascinated Lake Shikotsu beauty scenery in each season from the silky bath tub. Enjoy relaxing bath time from the private open-air silky bath tub. Or slip into the sights and sounds of Lake Shikotsu forest relax on window-facing sofa. A large tree towers and a spirit lives there, and a spring out also in the depth, and…. The hot spring onsen resort was filled in life of forest that spins the story which comes out in a fairy tale. We offer you the blessings of the forest keeping give us healing and vital with hospitality from the bottm of our heart. Cottage of the maisonette type was equipped with the open terrace where you can also enjoy forest bathing and sunbath as well as taking an onsen. Have a relaxed with feeling an abundant forest. We introduce about the access to our Tsuruga Group accommodation have open-air bath and out view bath. Tsuruga Group is the hotel group which develops 12 Japanese style onsen ryokans and one buffet dining in Hokkaido. We show you "Story in a Place" full of individuality respectively against the background of the nationalization and the abundant nature in the quasi national park both. Also, introduced 8 of accommodations that have the room with private open-air bath especially, at this time. We send you fascination of Lake Shikotsu, Jozankei, Niseko, and also including Lake Akan on the movie. Please see abundant ground for different faces expressively in every season. Copyright © TSURUGA GROUP. All Rights Reserved.